I thought it would be useful to have a further look at the macro nutritional balance of the PLCE side pocket menu, outlined in a previous article and video. In particular I thought it worthwhile to lay out an analysis of the amounts of carbohydrate, fat and protein in this diet – both proportionate and absolute – as well as the amounts of dietary fibre and sodium it contains. An average person weighing 60-80kg needs around 2,000-3,000 calories per day. This is a combination of basal metabolic functions using 1,500-1,700 calories per day plus everyday activities of a lifestyle with little or no exercise using a further 500-1,000 calories per day. You can calculate your calorie requirements here. How Many Calories Do Different Outdoor Activites Burn? Walking unburdened burns around 250-350 calories per hour, depending on your weight. Hiking with a backpack will burn more. Steep hills will consume more still. Indeed, sports scientists will tell you that exercising at a moderate rate uses 500-700 calories per hour. Energy consumption of top marathon runners is 1,300 calories per hour. A Tour De France cyclist will typically consume 6,500 calories per day. Three-season backpacking typically requires energy consumption of 3,000-4,000 calories per day. What Balance Of Nutrition Do We Actually Need? How should we obtain the calories we need? Should it be more from fats or carbohydrates? What about proteins? How much should we consume to maintain good body function and repair sore muscles on a hike? General nutrition advice for adults recommends 45-65% of the diet is made up of carbohydrates, 10-35% of protein and 20-35% of fats. Neuman, Pfutzner and Berbalk state that for normal physical training – as opposed to specific strength or endurance training – carbohydrate should make up 50% of the diet, protein 15% and fat 35%. This forms the basis of a good model for hiking. Further, even moderately active people need no more than 1g of protein per kg of bodyweight per day. Research suggests that even elite endurance athletes need only 1.6g/kg/d. A few people have looked at the PLCE side-pocket menu and concluded there isn’t enough fibre. To start with, we have to know how much dietary fibre nutritionists recommend we eat. The recommended intake of fibre for adults is 18g a day. There are a lot of misconceptions and partial evidence about salt and its effect on the body, particularly in the context of exercise. That said, it’s generally recommended that you eat no more than 6g of salt per day. This translates to 2.3g of sodium per day. In the following table is a breakdown of the macro nutritional value of the individual items, in the order they appear in the video. These values are manufacturer’s values, taken from the product packaging or the manufacturer’s website. I’ve also made some calculations of my own, summing the total weight, total calories as well as working out the calories per 100g of each product for comparison. I’ve taken the manufacturer’s percentage figures for carbohydrates (and contribution from simple sugars), fat, protein, fibre and sodium and multiplied them by the weight of each respective product packed into the side pocket so to give absolute amounts of each of these categories of macro nutrients. I’ve then summed these contributions to get total amounts of carbohydrate, fat, protein, fibre and sodium in the pack. I’ve also taken the total weights of carbohydrate, fat, protein, fibre and sodium in the menu, added them up and then calculated a percentage contribution from each. 1/ As mentioned in the video, the average calories per day this menu provides is approximately 3,000. This was the aim. Any less would have been too little, certainly for me. For a hard three-season hiking trip, where I was burning 3,500-4,000 calories per day, I would expect to lose some weight on this diet. 2/ The percentage contribution from carbohydrates was 55.2% (of which sugars contributed 18.1% to the total); fat contributed 20.5% and protein 19.0%. This diet is very much in line with general health guidelines on the recommended contributions from each food group. It’s a proportionate split which is also pretty close to the recommendations of the sports scientists. In fact fat is a little on the low side. 3/ With respect to protein specifically, this menu provides 795g of protein in total, averaging at 113.5g/day. I weight just under 100kg, so this diet easily provides me with the 1g/kg/day recommended for an active person. 4/ The fibre provided by this diet is 24.5g per day on average. This is 150% of the recommended daily minimum. Big contributors are the granola, cous cous and pasta. If you substituted wholemeal pasta for the plain, white pasta in the video, you’d have even more fibre. As an aside, wholemeal pasta would provide a few less calories per 100g but an increased amount of the B-vitamins you need to properly process carbohydrates. 5/ Sodium levels are higher than recommended. The big contributor here is the chorizo, contributing nearly 17g out of the 49g total. The packet pasta sauces also contain a significant amount of salt/sodium. By my calculations, the PLCE side pocket menu I propose in my video (and use from time-to-time myself) provides a balance of macro nutrients in line with both general health guidelines and with the recommendations of sports nutritionists. It provides a good amount of protein to enable repair while exercising as well as significantly more than the recommended daily minimum of dietary fibre. The one red flag is the amount of salt vs general health guidelines, although not all active/sports people agree with the general health guidelines (see the link above within the section on salt for more details on this). Unless I was hypertensive and sensitive to salt, however, I would not worry about this increased salt intake for a week, particularly if my levels of perspiration were higher than I was accustomed to. What I have not analysed here are the micro nutrients available in these foods. I think it would be reasonable to expect them to provide a lower level of essential vitamins, minerals and trace elements than a balanced diet of fresh foods. One solution to this would be a daily multi-vitamin and mineral supplement while using the above menu. Really interesting read Paul, thanks for going to the trouble. I feel that the diet that we regularly eat when living from a rucksack provides me with pretty much all the nutrition I need (unless, of course, Tom’s packed), it’s good to see a bit of empirical data that supports my own gut instinct (pun intended). Excellent. Glad you like it Stuart. Thanks for such a detailed breakdown. I was surprised at the amount of fibre the couscous provided as I had always put this alongside polished rice! Yes the salt is high and its no surprise its from packet sauce. While high, for just a week and with the added sweat, I would be content. What is of real interest is that this is affordable! Thanks for your comment and your food suggestions. I’ll have to try the bacon jerky. Sounds like it could be a worthy addition to the repertoire. Let us know how you get on with your next adventure. As a luxury item what about a small tin of bacon grill/spam. Depending on climate could easily be added half to pasta and the remainder for breakfast the following morning. It’s not the lightest solution but a smattering of luxury seldom is! Yes, luxuries are normally a compromise in weight or bulk. But then that’s partly why they are luxuries, right? 🙂 But as you say, great to have one or two of your favourites along with you if you can. We are trying to enjoy ourselves after all…. I think you have done a great job, I must admit the nutritional information on your chosen rations has been a great help, it’s very useful to to see exactly the structured and balanced diet that can stand alone for a week without wild foods, that in itself is a comfort, and makes this a great packing list. The high fats are what is needed when undertaking strenuous activities, especially in northern climates where the cold burns more calories while you stand still. Reading articles on keeping warm at night always suggests hydration and that you are well fed on a rich diet before going to sleep. Some people may have there own opinions on what’s best to pack, but the facts are there and ill definitely be making some changes to my packing list, based on your solid information. Thank you Paul … Great job !! Brilliant detailed well-researched information-rich stuff as always, Paul. Addicted to learning as I am, I always look forward to your next article or video. Interesting read again. on a recent day hike with a friend we decided to measure our calorie expenditure via heart monitors. I mean, you would wouldn’t you, it’s a gadget. Not for any particular reason, just interested. Anyway, at the point we had decided to finish we had both burnt 4,000 calories over 21 miles. Now this wasn’t a heavy backpacked day over a mountain, rather a day pack over the north downs. Didn’t bother with it for the final 7 miles home as batteries were running low. Anyway, I think it would be safe to say I would have been quite close to 5,000 calories for the day. So the pack you’re suggesting would offer me a good bulk to replace those expended calories, with a bit of weight loss to boot. Personally I think the pack also offers what we need in a good form to adequately extract the necessary nutrients over a period of time for the type of activities I would use them for. But as you mentioned, this is a pack for you, doing the things you do. It has been put together to both match the energy requirements and flavours you need for an extended time away. We all need to look at what our requirements are and make informed decisions from it. I’m certainly a good bit heavier than you and do not regularly do extended trips, so would have to consider perhaps a slightly higher calorie intake if I wished to sustain 7 days heavy pack walking. But now I feel I’ve got a bit more information to make that informed decision. And let’s not forget the importance of keeping well hydrated as this will aid the uptake of nutrients. All in all, another powerful string to my bow called bushcraft. Looks like exactly the sort of thing I would pack, I’d probably have some wine gums or similar for an energy boost (even if it’s mainly phsycological) when I felt I was flagging. Excellent stuff, again. I loved the original article, as it backed up more or less exactly what I’ve been doing for some years now, and this one adds a neat layer of science and hard facts. Thank you for taking the time – both for the original video, this article, and the site in general – I may not comment much, but I always read/view – and always really appreciate them. I’d also like to say thanks to all those who do comment – it’s always good to see what others think. Since I now have to avoid gluten my outdoor menu has changed slightly, but not too much as to be indistinguishable from that you demonstrate. In fact I find the gluten free alternatives are actually better at providing quality carbs than the original white wheat flour pasta, for example. Keep up the always excellent work – only just discovered your flickr site too (via the excellent firelit photo) and I am looking forward to more pics there! Just wanted to say thanks A/ for another great article B/ for taking the time to produce this and the original presentation C/ For such clear concise and evidentially based information. First of all great subject! My own in-the-field-menu is almost identical. Just easy and it works. I really like the table view approach. A lot of work but it gives you more overall information. How does this menu change when you are in Northern Sweden in Winter? What additional preparation do you need to do to stop the food from freezing prior to cooking? Also, if you didn’t have to carry the food yourself, for example you’re travelling by dog sled for a week, would that change the make-up or contents of your menu? As always, your articles are a brilliant read and provide practical and sound advice on how to enjoy the outdoors. Anyone who doesn’t realise how much thought and experience you put into your articles is thinking clearly enough. I’ve been walking and camping forover 60 years yet I stil manage to learn something new from your articles. Your current articles on food and nutrition are very important and relevant. Clearly there has been a lot of research undertaken by experts in this field. You have read and digested it (irresistable pun) so I don’t have to. I’ll be honest and say that i know nothing about nutrition, but I found this article easy to read and understand. Another great article Paul, thanks. That is a very usefull article and going in depth. thanks for sharing, you have spend a lot of time on this. It breaks down the nitty gritty of what I need to do…ie total energy needs, versus , breakdown of balance of nutrients- macro and micro. As a happy go lucky hiker…I would have just packed something randomly…its interesting to apply my intellect to something I enjoy…I think there is place for flexibility ie…some of the threads in previous articles give alternative ideas for food. As I now know what I need to do…ie carb, prot, fats….and in which balance…I can then adapt to my needs. brown pasta- as it is wholesome , get broken down slowly- keep blood sugars high at a steady level for longer – so avoids fluctuation. They compare with fruits, similar to how fructose in broken down as opposed to chocolates. chocolates serve as treat or instant fix. Nuts are compact high energy resouces for those who can have them ie no nut allergies. This is ideal for short time, not for a daily basis. Lean meat and fish – dried, grilled add variety as well as protein. Avoid smoked versions as these are carcinogenic..best cook them on your grill/fire and smoke from fire adds the flavour. Multivit capsules are excellent idea. Sensible foraging should add to the greens. I said sensible as some of the plants are high in oxalic acid and you have rightly pointed this out…urinary stones etc. Sensible foraging in balance! Do read or chat to people who have been on slimming world or weight watchers diet…these focus on a balance of carb, prot, fat and in what ration and how to blend it in while adding flexibility. Take a feather out of this , and see what you can add to when hiking/camping. Salt – less the better. however the point about salt replenishment to cover up loss due to activity makes sense. Keep hydrated. What this articles is a excellent structure to build on , adapt to each ones needs. Do read or chat to people who have been on slimming world or weight watchers diet…these focus on a balance of carb, prot, fat and in what ratio and how to blend it in while adding flexibility. Take a feather out of this , and see what you can add to when hiking/camping. Thanks for another great report, Paul. Coming from South Africa I always carry Biltiong with me when camping. I just wanted to add, that from my experince, packing food for any type of endeavour allways falls down when what you pack is very different from what you eat normally! For instance i know long distance athetes (50K + runs), that whilst in a race feed off chunks of cheese and dried sausage(salami), but they have a fairly paleo diet normally. However other freinds have tried this race diet and failled, because we beleive their normal diet isnt geared up to processing fat as a main source of energy! I would be interested in your views on this, as its something i have been pondering about ( in the best Pooh Bear Tradition) for some time now. Excellent video on the menu and a great deal of useful information. I’ll review and take notes for sure. Thanks for the effort put into this valuable video and your comments. I will certainly share these posts with my friends. How good of you to break down your rations into the basic nutritional essentials. Military specialists have been doing this for a long time. Caesar, in fact, searched for a super food for his legions. Recently, I’ve seen some reviews of 24 hour military ration kits from France, Germany, the U.S and others but not Britian. I think it would be interesting to compare your menu with some of these, especially if you could include a British example. Water, of course, is the most important nutritional element often not regarded in nutrition charts because it’s not food. But without water, food is worthless. I really enjoyed your article and look forward to next one. The first article/vid was great.The side pack you show is one of the best for this kind of activities and purpose.Regarding the contents I would add some isotonic powder and a handful of dried apricots or figs.I also take a piece of fig. bar with almonds…..a tipycal southern Spain meal. The second article it is a real lesson in bromatology.Well done and Thank you for sharing. I tend to buy readymade cous cous meals, rice from places like 99p shop make my own flapjacks and if in camp wild edibles to supplement to food carryed in. Regards craig. Great article Paul, thank you. Dried kidney beans take a bit of planning and time but a hand full with a cup of water in an expandable dry bag or overnight, followed by an hour on a wood burner provides a really good balance of carbohydrates, protein and fibre. Throw in some fusilli cook for a further ten minutes, a mini peperami, a sachet of Tabasco and give Heston a call. Outstanding, I love this Paul, its great to stay fit and eat the right food. It’s always good to have other people’s ideas on food as it’s really what it’s all about. A very informative article and it has given me plenty to think about. Something you should be aware of is that 1 kg of bodyfat is about 8000 calories to burn. Your body can use more than that but is unable to turn food in that amount of energy. Thats why you can eat all day and still lose weight. Your body is unable to digest that amount of food in such a short time. Food and outdoor is a very interesting subject. Excellent synopses and one not found in this context elsewhere. It was acknowledged the temporal nature of this diet during periods of high physical exertion. However, the ingredients of some of these items are killing some of us when you consider the MSG, presevatives, and high-octane additives. Forging a tight relationship with a food dehydrator over many years of experimentation and integrating this nutrition information can result in a healthy and effective food strategy. Anyway, well done and much appreciated. This article was the first of its kind I’ve found. Great article! As a type 1 diabetic and personal trainer I have spent more time that I care to remember reading nutrition data off the back of packets and creating lists like yours for one reason or another. It’s great that you’ve shown a clear layout and added the best current guidelines for each aspect of the macronutrients. Hopefully people can take this idea away and develop it based on what you’ve given them. From my experience I’ve found that the guidelines must be taken as guidelines and your diet needs to be adapted to suit what best works for you in any situation. Good nutrition really does make the difference when you need to make important decisions, either at home or in the great outdoors. Finally, in my opinion, anyone with questions on the micronutrients (vitamins and minerals) should to talk to a Nutritionist as that is a whole specialist science that can really cause problems if played with too much in the wrong manner. Yes totally agree. I like my grub too. Its an amazing moral boost to have a tasty and satisfying meal at the end of a hard days trek. Some of the expedition food I’ve tried has the same flavour as the packaging it comes in. One thing I like to take is fruit and nut flapjacks, home made of course. Tasty and long lasting energy with a good mix of essential oils and fats. Like the idea of dried mushrooms, have found little pots of powdered shiitake mushrooms gives good flavour. Great talking to you yesterday. Appreciated. PS : Will be more careful imputing Email address in future. Whoops! I’m a fan of flapjacks too, I have to say. I find them particularly good on winter hikes. The powdered shitake mushroom idea is not one I’ve tried. Do you have a brand or outlet where you could recommend purchasing them? Or do you prepare your own? they seem pricey but a little goes a long way. The Umami isn’t too bad either. Great article. Clear, concise info as usual. Quick question for you. I’m a little under weight so given you would expect to lose a little on this diet what calorie dense addition would you include to really boost the daily intake? When I saw how much food you were able to pack, I certainly felt that the nutritional values would be sufficient. In really cold weather or rough country it might be a little slim, but we eat too much anyway. People always seem to look for any thing to complain about. Talk is cheep, results count, and you seem to get the results. Keep up the good work and thank you for your efforts. Paul, I’ve always bulked up the weeks before an extended trip, building that all essential ‘survival muscle’ , the extra tire or small Buddha belly. Everyone I ever did a big trip with who was ripped with a 6pack we’re the first to faulter, the first to actually run out of calories.! Yes, these I go away on a trip – hiking or canoeing for example – for a couple of weeks and lose a good few pounds. You don’t notice it until you’ve lost a fair bit, then your hunger and food intake goes up significantly. Then things “normalise” again after being closer to home again. If you start on trips too thin, then the deficit can kick in a lot earlier and be a real issue. And I speak as someone who used to race cross country mountain bikes and have 8% body fat. Great article Paul ,loved your food selection iam doing the Wicklow way trek 120 km over four days later this year in Ireland and will follow your advice . Well done, Paul. Your ‘winter camping’ tips are, as usual, spot on! Thanks again for the information. Most appreciated you go to the trouble to share your knowledge with every one. You’re very welcome Peter. I am very glad you found this information so useful. Both this info and the video are great, well worth sharing with others. I always advocate dry foods as a bulk staples if you need to carry food for several days. I usually add a bag of flour and a few packets of yeast power. either flat bannock, stick twists, or a risen loaf is such an amazing moral booster to a group and can be made on a rock in the side of the fire. In the embers or someones Billy can. Thanks again I’ll share this with others. Thanks Dave. Agreed – hard to beat a good bannock or even a flatbread. Thank you for another informative video.We are all aware that the amount of calories, and diet depends on which season is now.Some said it is too fat but fat are always needed. I have found this video and link one of the most helpful links you have made. Though I do not wish this to undermine the value of your other blogs/videos which i have always found very helpful and informative. I am relatively new to the skills of bushcraft and last year (2015) I set a personal challenge to spend one weekend in each month, wild camping, which I was able to keep. I wish to develop my skill set to be able to go out on a hike for a week. Food was the biggest obstacle in me being able to achieve this. This obstacle was busted with the release of your video. I have already tried many of the meals you have set out and it has given me great confidence for my next challenge in 2016. The work and time you put into these blogs has not gone unnoticed and I for one have found many of them invaluable. The fact that you offer them as a free service is very admirable and very much appreciated. Your blogs are becoming my bible in the development of my own skill set. Paul, you do a great job putting things together, but no matter how right you are, there are always those people that think they know everything better than anyone else and they will always make remarks about everything you or anyone else say just trying to make everyone think they are smarter, and of course which they really are not !! I realize that I too will receive negative remarks about what I have just written, but at my age I really don’t give a darn !! Keep up your great work Paul !! as always your videos & blog provides great real life knowledge & info gained from actual experience in the field, I personally thought that the food you pack for a week in the field was really good & it’s food that is tasty, is going to give you enough cals for recovery, & is robust so not going to be a pile of mess in the bottom of your Bergen or day sac, good effort, once again cheers for passing your knowledge on to others. I read this article last year when I was preparing for a 116 km canoeing trip in Bowron lakes PP (British Columbia). Since it was my first big trip, I was a little bit worried about the amount of food we would need. But a the same time did not want to bring to much with us, since there where several portages. We really benifitted from your sound advice!! I especially found the part regarding the daily amounts needed (fibres, proteins, fat, etc.) very usefull. We spent half a day in the supermarket reading labels and making computations ;-), but saved a lot of money. Further more we really enjoyed our meals and never felt really hungry. Even when the weather turned bad after one day (heavy rain, hail, a lot of wind and frost during the nights) we had enough calories in our stomach to stay warm! Keep up the good work! I have to admit that I am not a person that leaves a lot of comments, but I really enjoy reading your articles. It’s good to hear from you. Thanks for taking the time to leave feedback on this. 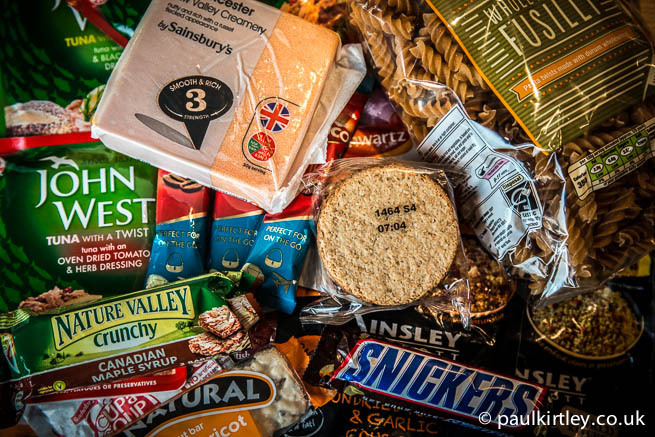 I’m very happy to read that my articles on packing food for trips have been very useful to you – both in terms of making sure you were well fed but also saved money. Did you enjoy the Bowron Lakes area? Well done Paul … Very helpful … Funny you mentioned supplements, I’ve been using a few supplements with your guidelines on your weeks worth of food in the PLCE something I do anyway but will add the extra that you may need to fully balance your meals per day. I had them included in my medical kit … for illness if run down. Great follow up article Paul and I love the chart. That’s for taking the time and breaking this down for us. I will admit this is one of my downfalls, I never eat enough during the day and then I get burned out by the days end. The bacon butty eh. No1 comfort food. What are the thoughts about vacuum packaging, and its’ shelf, or rather bush life. I have often looked at Aldis’ twinpacks of round gammon steaks and thought surely they should last at least a couple of days. Just the right size for a 1 egg frying pan. And an egg on top? Anyone hungry yet?